No pre drilling is needed as the combination of a heat treated, sharp point and aggressive starting threads with fine thread up the shank provides a positive threading, chip free hole. The sharp point provides positive, fast starts in sheet metal. The fine thread up the shank rolls the material back instead of cutting chips that corrode quickly and cause a rattle in ductwork where vibration is present. The rolled material creates a larger bearing surface creating a more positive hold. The fine thread also provides better clamping forces on thinner materials. 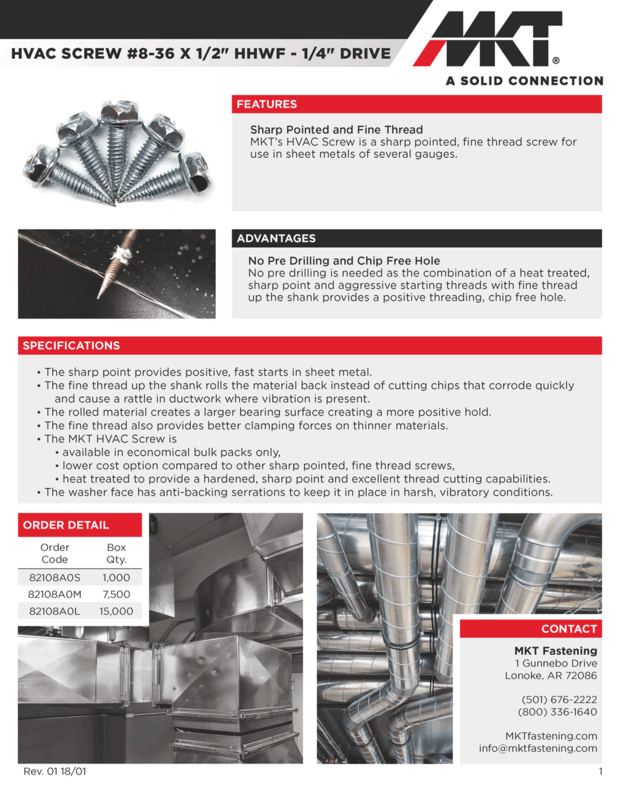 heat treated to provide a hardened, sharp point and excellent thread cutting capabilities. The washer face has anti-backing serrations to keep it in place in harsh, vibratory conditions.